123 ABCSOLD - 4 steps to sell your house fast! Describe your property for us – Quick, Easy & Free! We’ll present you w/ a fair written, no-obligation offer. It’s free so why not find out? We close at a local reputable title company, cash in your hands in as little as 7 days. End Result: When we buy your house, it’s an easy and fast process. Timeframe: Usually you’ll get your fair all-cash offer within 24 hours. Then you could be walking out of closing in as quick as 7 days… or on your schedule – whichever timeframe works better for you. AA Properties buys houses in and around Houston directly from homeowners with NO fees or commissions. 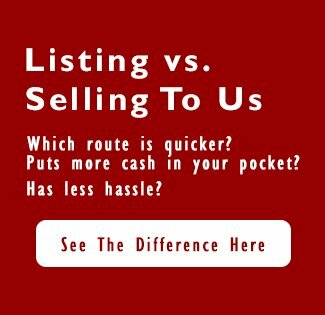 We do not want to list your house. We actually want to buy it. That’s what we do. We are a real estate company that buys houses directly from homeowners. We cut out the middlemen: real estate agents and mortgage companies. So you will NOT pay the typical fees and commissions. We have funds ready and waiting for us to find another property to buy. We can pay you cash, close quickly, and put cash in your pocket in just a few days. You won’t have to do any painting, repairs, or remodeling. Or pay a contractor to do anything. We’ll buy your house in any condition because our crews will take care of any work that needs to be done. Our team will even clean it so you don’t have to.